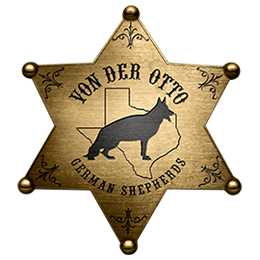 Von der Otto German Shepherds Offers and easy credit card payment option at no charge. To place a deposit or to make a final payment by Visa, MasterCard, Discover or American Express simply click on the MAKE PAYMENT and enter your credit card information. TEXAS SALES TAX WILL BE CHARGED TO CUSTOMERS FOR DOG OR PUPPY PURCHASES, UNLESS THE DOG OR PUPPY IS SHIPPED OUT OF STATE. For more information read about the TEXAS STATE SALES TAX RULES AND REGULATIONS regarding breeders. Texas Sales Tax will be charged for dog and puppy purchases, unless shipped out of state. Cash can be paid on the same day you picked up your puppy, but ONLY cash We do NOT accept personal or business checks, cashier checks, money orders or travelers checks when taking possession of our puppies. Except for Cash, payments will have to be paid in advance or you will NOT receive your puppy on the same day you visit our kennel. You will have to come back and pick up your puppy when full payment has been received or cleared from your bank. Payment requirements also include any shipping cost owed. The above shipping cost is figured on flights inside the United States, oversees will incur additional charges. The shipping costs are the responsibility of the buyer. Fees include a health certificate, shipping crate and plane fare. Due to airline cost increases this is subject to change at time of shipment. All shipping costs must be paid before shipping. Return Policy is included in the Written Guarantee given to owners at the time of purchase.